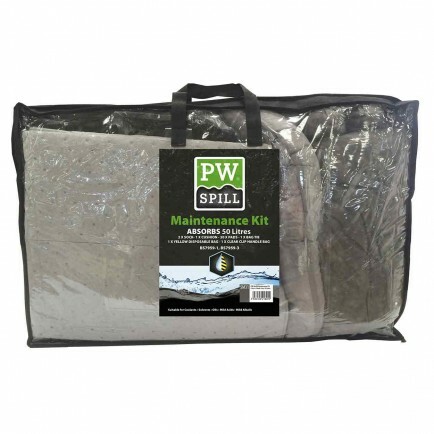 A waterproof holdall with durable pads for spills of up to 50 litres. The waterproof holdall of this kit allows it to be stored outside and it's bright yellow colour means it is easily visible. Black maintenance pads have coverstocks that hold the pads together even when saturated. Socks are double stitched providing maximum fluid retention. This kit contains 50 pads, 4 socks and 5 bags with ties and conforms to BS7959-1 and BS7959-3.